Bolivia is a country known for its outstanding beauty and deep cultural and historical richness. Due to its diverse mix of landscapes and cultural experiences, it is a popular destination for adventure seeking tourists. Despite it being a popular place to visit, there is still a great need for housing, as there are many families who still live in substandard homes. We work with families who live just outside of the administrative capital, La Paz, in the city of El Alto. The two cities sit at an altitude of 12,000-14,000 feet and offer breath-taking views all around. Between the friendly locals, the amazing views, and the extremely dedicated staff, this is a place you are going to love visiting and building in! 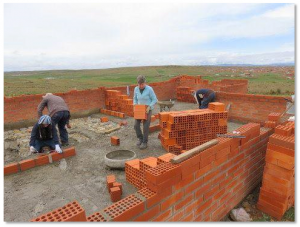 There are several ways that you can get involved: donate to support this specific partner, volunteer on one of our Bolivia Global Builders teams, which you can learn more about below, or join a trip as a virtual volunteer, choosing to donate your travel costs instead of making the trip. We make virtual volunteering fun — see virtual volunteering explained here! The Fuller Center Bolivia was started by two brothers, Carlos and Alex Aramayo, who had previously built 600-700 homes through an independent organization. They joined the Fuller Center so they could be part of something larger and have a greater reach. They are building in the city of El Alto which sits at 13,600 ft, but don’t let the altitude scare you as FCH Bolivia does an excellent job of helping you adjust. Each trip to Bolivia is with a group of mission-minded volunteers – typically 8-20 total – who want to experience the world, meet new people, and make a difference. No skills required. Trips last 1-2 weeks and include sightseeing in this beautiful, mountainous nation. Our teams work primarily with indigenous families who have been lured to the city of La Paz with hope for a better life, but find themselves living on the urban periphery in the city of El Alto. The families typically consist of three kids and two parents, as well as a number of single parent households. Many of the families earn their income through growing fruits and vegetables which they sell in the markets called ferias. Others work as laborers in the various industries located in La Paz and El Alto. 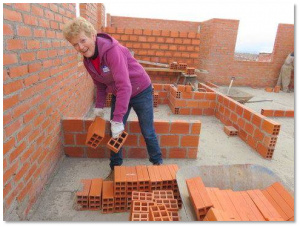 We are building mostly new homes in the El Alto area. The homes are built with bricks and are typically around 750 square feet. Work typically involves helping the masons and carpenters. This work involves laying bricks, mixing/carrying cement and mortar, digging the foundation, and helping construct the roof. We provide necessary tools, but as with most build sites, it never hurts to bring a few small hand tools with you. A small bus will be rented to transport the group throughout each day. The distance from the hotel to each work-site will vary, but on average it is about 30 minutes. Due to the busyness of the city, groups will need to leave early in the morning, around 7:00am, to beat the morning rush. Bolivia is a country full of beauty and breath-taking views which means there are a lot of sightseeing opportunities. In La Paz, where groups will be staying, they have gondola’s that go high above the city that offer incredible views. Lake Titicaca is also close by and is a must see destination. There are also markets and other things to see around the hotel teams are staying at. We will work with you to set up cultural and sightseeing opportunities for you and your group. Most seven day trips will cost between $900-$1,000. Two-week trips will cost more, ranging between $1,600 and $1,700. More precise budgets are custom and are developed for each trip. The trip fee includes food, lodging, all in-country transportation, emergency medical and evacuation insurance, and a donation to the project. As trips with openings become available, we post them at the top of this page. To apply to join their trip, simply click “Join” next to the trip of your choice. To request more information or be put in touch with the team leader, click the “Request more information” button at the top. If you’re an experienced traveler or team leader, or if you have a group of your own (church, school, etc. ), Propose a Trip to let us know what you might like to do! Note that US citizens must obtain a visa for travel to Bolivia. Visit travisa.com for information on required documents and talk with the Global Builders Coordinator or your Team Leader if you have questions.